Pictured above: Bill Johnson, Joyce and Russell Yeoman – Easter Day 2 near Warwick in Queensland in the 1990sCongratulations to Joyce Rowlands and Graeme Cadman on being recognised by the International Orienteering Federation for being the oldest Mountain Bike Orienteers in World Masters Competition, both being over 80 years old. Joyce is 84 and Graeme is nearly 86. 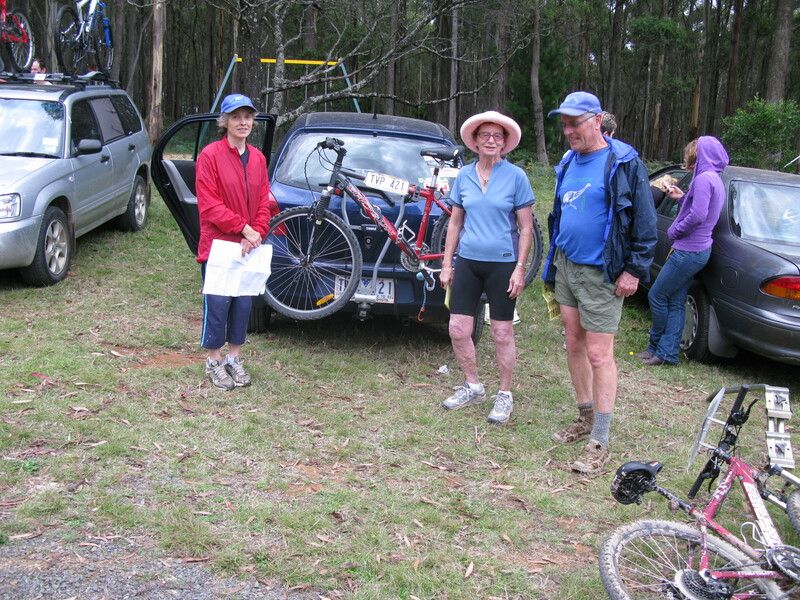 Pictured: Helen Edmonds, Joyce and Ron Frederick on the day Joyce lost the bike off the back of her car at Korweinguboora. All Summer 75 MTBO events have a “score” format with riders having 75 minutes to visit as many of the 20 controls as they can (or want to). This year’s Summer 75 MTBO events will use SportIdent timing, so make sure you bring your SI stick. If you don’t have one, we will have loan SI cards available. The first Victorian State Series event for the year will be held on April 2nd. It was planned to run the event on our new Blackhill map, near Kyneton, but we have run into permission issues. The event is now listed to run on our Bunjil map, an old favourite, at Little Forest, near Ballan. Rex Niven is course planner and Steve Bird is the event adviser. We have already applied for an event permit from DELWP and have permission to use private property abutting the forest. We are also looking for volunteer organisers and course planners for the other events on the above fixtures. Please contact Robert Edmonds if you are able to assist in these capacities. The major event of 2017 is the Easter Carnival and World Masters which are being held in New Zealand. The Oceania Championships and Middle Earth events will take place around Auckland and Rotorua from 14-20 April. Standard entry date closes on Feb 28. The fun continues with the World Masters Orienteering Championships (at World Masters Games) taking place from 21-30 April. Registrations for the World Masters close on January 31. The events will be held close to Auckland. The Peninsula Metrogaine &Cyclogaine on Sun Mar 5 will be a very popular event. The $5 is an arbitrary amount that should be considered with the whole membership fee and OV budget. $30 of the adult club membership fee also goes to OV and helps pay for the magazine. Last year, only 44% of households ordered the magazine which represented less than 30% of individual membership. This year everyone contributes to the magazine. Membership is now cheaper than ever. NE/OV adult membership is $35 and junior membership (under 21) just $6. It includes a subscription to the AO quarterly magazine, with a choice of hard copy or online PDF only. For those who join OV, club membership is free. Second club membership remain at $5. Social membership remains at $5. Social Members are generally long standing members who no longer take part in events but are happy to help at events, join in social activities or just keep in touch through our newsletters. They may be in a family with active orienteers, but not active themselves. People who take part in any OV sanctioned events are now expected to join a club and OV. Members who participate in park and street, can’t be social members only. Please pay social membership fee direct to the club treasurer, Schon Hudson or membership secretary, Rob Edmonds. Social membership is no longer available online through Eventor.